SPOILER ALERT! 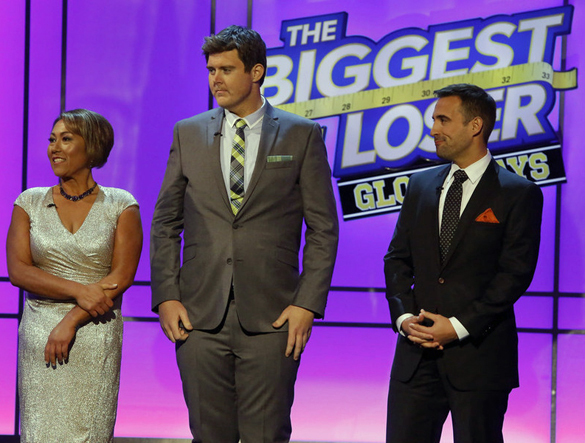 We’re recapping tonight’s The Biggest Loser finale (get all the recaps here! ), so avert your eyes if you don’t want to know what happened. Tonight’s Biggest Loser Season 16 finale was peppered with triumphant former contestants through the audience, perhaps as a counterpoint to the New York Post interviews with former contestants who didn’t have the best experience on the show. But if you were a fan of the show, you were treated to some all-star weight-loss transformations and an ending that was nearly a photo finish. Before we got to see the contestants, Alison Sweeney, in a killer black studded dress, introduced the trainers, who also looked pretty smashing. Dolvett talked about this season’s athletic competitors and said what a thrill it was to train athletes. So who would take home the at-home prize? The non-finalists were introduced in small groups, each group weighing in to see who would take the at-home title and $100,000 check. At this point, Blake was in the lead — an amazing transformation for someone who admittedly struggled in her first few weeks on the ranch. By losing nearly 43 percent of his original weight, Jordan took home the hundred grand for the at-home prize. Sonya stepped out in a silver wrap dress looking like the “younger sister” version of her former self. Rob, who scowled and sulked his way through much of season 16, strode the stage with a huge smile. Dr. Huizenga informed him that everything he showed up on the ranch with — sleep apnea, prediabetes, high cholesterol, high blood pressure, you name it — all have basically disappeared with his weight loss. They saved Toma for last, and he looked just as amazing as everyone else. Okay, perhaps a bit more amazing. Hi! Just a heads up — the caption for the top photo appears in newsfeeds, so your spoiler alert ends up coming after the spoiler. Not a problem for me, but thought you might want to fix that for others! Cheers.